We hope you've been enjoying the installments of "The Interview", the Fifty Shades of Grey Screenplay Adaptation by Chad from @50ShadesCasting. 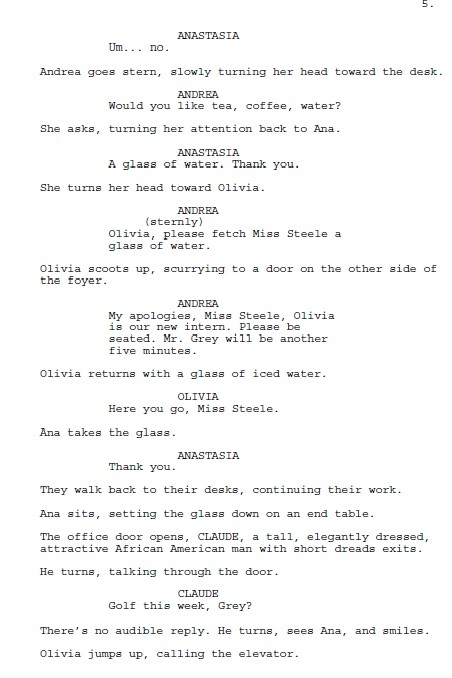 This is not the actually screenplay but it looks very similar to an actual screenplay and gives us an idea of what the real one might look like. Please take a few moments to send Chad some feedback on his @50ShadesCasting twitter account or leave him a comment below. We will be posting more installments of "The Interview" over the next few days. Please follow us on Sulia for update alerts. Make sure you are following us on Facebook and Twitter @FiftyShadesFilm for all the Fifty Shades of Grey breaking news and information.